రక్తపింజరి పాము జాతులు చాలా ఆగ్నేయాసియా ప్రాంతాలు, భారత ఉపఖండం అంతటా మరియు ఆసియాలో దక్షిణ చైనా నుండి టైవాన్ వరకు విస్తరించి ఉన్నాయి. దీనిని కాటుక రేకుల పాము అని కూడా పిలుస్తారు. దాని ప్రకోప స్వభావం కారణంగా ఏ ఇతర విషసర్పాల కంటే కూడా ఎక్కువ మానవ మరణాలకు బాధ్యత వహిస్తుంది. దాదాపు అన్ని భారతీయ పాముకాటు మరణాలకు కారణమైన నాలుగు విష స్రావము గల సర్పాలలో ఇదీ ఒకటి. ఈ పాము గరిష్ఠంగా 166 సెం.మీ. (5.5 అడుగులు) పొడవు పెరుగుతుంది. అయితే సగటు పొడవు, ప్రధాన భూభాగంలో 120 గురించి సెం.మీ. (4 అడుగులు). అనేక ఇతర విష సర్పాలు కంటే ఇది మరింత సన్నగా నిర్మించబడింది.దిత్మార్స్ (1937) "సరైన పరిమాణపు వయోజన నమూనాను" కొరకు ఈ క్రింది కొలతలు నివేదించారు. రంగు నమూనా దాని శరీరం యొక్క పొడవు అమలు ఆ ముదురు గోధుమ రంగు మచ్చలు మూడు సిరీస్ తో లోతైన పసుపు, తాన్ లేదా గోధుమ గ్రౌండ్ రంగు, ఉంటుంది. ఈ మచ్చలు ప్రతి దాని చుట్టూ ఒక నల్లని రింగ్ ఉంది, ఇది బాహ్య సరిహద్దు తెలుపు లేదా పసుపు ఒక చట్రంతో తీవ్రమైంది ఉంది. మెదడు మచ్చలు, సైడ్ మచ్చలు విభజించు మే అయితే ఇది సాధారణంగా సంఖ్య 23-30, కలిసి పెరగడం ఉండవచ్చు. తల ఒక pinkish, సాల్మన్ లేదా బ్రౌనిష్ వి లేదా జంతువుల ముట్టె భాగము వైపు ఒక శిఖరాగ్ర ఆ రూపాలు X నమూనా కలిసి, ప్రత్యేకమైన కృష్ణ అతుకులు, ప్రతి ఆలయం న ఒక ఒక జత చేసింది. కంటి వెనుక, గులాబీ లేదా బ్ తెలుపు అంశాన్ని ఒక చీకటి పరంపర, ఉంది. ఉదరకుహరము తరచుగా కృష్ణ మచ్చలు ఒక సక్రమంగా పరిక్షేపం తో,, తెలుపు whitish, పసుపు లేదా pinkish ఉంది. English – Russell's viper, chain viper, Indian Russell's viper, common Russell's viper, seven pacer, chain snake, scissors snake. Previously, another common name was used to described a subspecies that is now part of the synonymy of this form: Sri Lankan Russell's viper for D. r. pulchella. Telugu – katuka rekula poda. or raktha penjara/penjari. Kannada – mandaladha haavu or mandalata havu, kolakumandala. Tamil – retha aunali, kannadi virian or kannadi viriyan. Malayalam – mandali, ruthamandali, manchatti, shanguvarayan, "Rakta Anali"
Found in Pakistan, India, Sri Lanka, Bangladesh, Nepal, Myanmar, Thailand, Cambodia, China (Guangxi, Guangdong), Taiwan and Indonesia (Endeh, Flores, east Java, Komodo, Lomblen Islands). The type locality is listed as "India". More specifically, this would be the Coromandel Coast, by inference of Russell (1796). Brown (1973) mentions that it can also found in Vietnam, Laos and on the Indonesian island of Sumatra. Ditmars (1937) reportedly received a specimen from Sumatra as well. However, the distribution of this species in the Indonesian archipelago is still being elucidated. Within its range it can be very common in some areas, but scarce in others. In India, is abundant in Punjab, very common along the West Coast and its hills, in southern India and up to Bengal. It is uncommon to rare in the Ganga valley, northern Bengal and Assam. It is prevalent in Myanmar. It is not restricted to any particular habitat, but does tend to avoid dense forests. 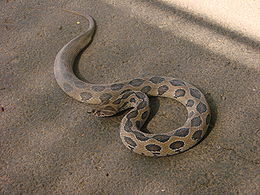 The snake is mostly found in open, grassy or bushy areas, but may also be found in second growth forests (scrub jungles), on forested plantations and farmland. They are most common in plains, coastal lowlands and hills of suitable habitat. Generally not found at altitude, but has been reported as far up as 2300–3000 m. Humid environments, such as marshes, swamps and rain forests, are avoided. This species is often found in highly urbanized areas and settlements in the countryside, the attraction being the rodents commensal with man. As a result, those working outside in these areas are most at risk of being bitten. It should be noted, however, that D. russelii does not associate as closely with human habitation as Naja and Bungarus (cobras and kraits). Terrestrial and active primarily as a nocturnal forager. However, during cool weather it will alter its behavior and become more active during the day. Adults are reported to be persistently slow and sluggish unless pushed beyond a certain limit, after which they become fierce and aggressive. Juveniles, on the other hand, are generally more active and will bite with minimal provocation. When threatened they form a series of S-loops, raise the first third of the body and produce a hiss that is supposedly louder than that of any other snake. When striking from this position, they can exert so much force that even a large individual can lift most of its body off the ground in the process. These are difficult snakes to handle: they are strong and agile and react violently to being picked up. The bite may be a snap, or, they may hang on for many seconds. Although this genus does not have the heat-sensitive pit organs common to the Crotalinae, it is one of a number of viperines that are apparently able to react to thermal cues, further supporting the notion that they too possess a heat-sensitive organ. The identity of this sensor is not certain, but the nerve endings in the supranasal sac of these snakes resemble those found in other heat-sensitive organs. The Russel's Viper in Pune, India. It feeds primarily on rodents, especially murid species. However, they will eat just about anything, including rats, mice, shrews, squirrels, land crabs, scorpions and other arthropods. Juveniles are crepuscular, feeding on lizards and foraging actively. As they grow and become adults, they begin to specialize in rodents. Indeed, the presence of rodents is the main reason they are attracted to human habitation. Juveniles are known to be cannibalistic. This species is ovoviviparous. Mating generally occurs early in the year, although gravid females may be found at any time. The gestation period is more than six months. Young are produced from May to November, but mostly in June and July. It is a prolific breeder. Litters of 20–40 are common, although there may be fewer offspring and as little as one. The reported maximum is 65 in a single litter. At birth, juveniles are 215–260 mm in length. The minimum length for a gravid female is about 100 cm. It seems that sexual maturity is achieved in 2–3 years. In one case, it took a specimen nearly 4.5 hours to produce 11 young. These snakes do extremely well in captivity, requiring only a water dish and a hide box. Juveniles feed readily on pinky mice, while the adults will take rats, mice and birds. However, many adults do not feed, with one having refused all food for five months. Breeding is not a problem either. On the other hand, they do make quite dangerous captives. When handled, specimens have been known to use their long, curved fangs to bite right through their lower jaw and into the thumb of the person holding them. The amount of venom produced by individual specimens is considerable. Reported venom yields for adult specimens range from 130–250 mg to 150–250 mg to 21–268 mg. For 13 juveniles with an average length of 79 cm, the average venom yield was 8–79 mg (mean 45 mg). The LD50 in mice, which is used as a general indicator of snake venom toxicity, is as follows: 0.08–0.31 μg/g intravenous, 0.40 μg/kg intraperitoneal, 4.75 mg/kg subcutaneous. For most humans a lethal dose is 40–70 mg. In general, the toxicity depends on a combination of five different venom fractions, each of which is less toxic when tested separately. Venom toxicity also varies within populations and over time. Because this venom is so effective at inducing thrombosis, it has been incorporated into an in vitro diagnostic test for blood clotting that is widely used in hospital laboratories. This test is often referred to as Dilute Russell's viper venom time (dRVVT). The coagulant in the venom directly activates factor X, which turns prothrombin into thrombin in the presence of factor V and phospholipid. The venom is diluted to give a clotting time of 23 to 27 seconds and the phospholipid is reduced to make the test extremely sensitive to phospholipid. The dRVVT test is more sensitive than the aPTT test for the detection of lupus anticoagulant (an autoimmune disorder), because it is not influenced by deficiencies in clotting factors VIII, IX or XI. In India, the Haffkine Institute prepares a polyvalent antivenin that is used to treat bites from this species. D. r. russelii (Shaw, 1797) Indian Russell's viper Across the Indian subcontinent through Pakistan and Bangladesh to Sri Lanka. D. r. siamensis (M.A. Smith, 1917) Eastern Russell's viper From Myanmar through Thailand, Cambodia, Indonesia and southern China. Also found in Taiwan. D. r. formosensis, Maki 1931 – found in Taiwan (considered a synonym of D. r. siamensis). D. r. limitis, Mertens 1927 – found in Indonesia (considered a synonym of D. r. siamensis). D. r. pulchella, Gray 1842 – found in Sri Lanka (considered a synonym of D. r. russelii). D. r. nordicus, Deraniyagala 1945 – found in northern India (considered a synonym of D. r. russelii). The correct spelling of the species, D. russelii has been, and still is, a matter of debate. Shaw & Nodder (1797), in their account of the species Coluber russelii, named it after Dr. Patrick Russell, but apparently misspelled his name, using only one "L" instead of two. Russell (1727–1805) was the author of An Account of Indian Serpents (1796) and A Continuation of an Account of Indian Serpents (1801). McDiarmid et al. (1999) are among those who favor the original misspelled spelling, citing Article 32c (ii) of the International Code of Zoological Nomenclature. Others, such as Zhao and Adler (1993) favor russellii. In the future, more species may be added to Daboia. Obst (1983) reviewed the genus and suggested that it be extended to include Macrovipera lebetina, Vipera palaestinae and V. xanthina. Groombridge (1980, 1986) united V. palaestinae and Daboia as a clade based on a number of shared apomorphies, including snout shape and head color pattern. Lenk et al. (2001) found support for this idea based on molecular evidence, suggesting that Daboia not only include V. palaestinae, but also M. mauritanica and M. deserti. 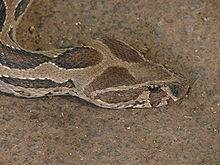 The rough-scaled sand boa, Gongylophis conicus, possibly mimics the appearance of D. russelii. Some herpetologists believe that, because D. russelii is so successful as a species and has such a fearful reputation within its natural environment, another snake has even come to mimic its appearance. Superficially, the rough-scaled sand boa, Gongylophis conicus, has a color pattern that often looks a lot like that of D. russelii, even though it is completely harmless. ↑ 6.0 6.1 Mehrtens JM. 1987. Living Snakes of the World in Color. New York: Sterling Publishers. 480 pp. ISBN 0-8069-6460-X. ↑ 7.0 7.1 Brown JH. 1973. Toxicology and Pharmacology of Venoms from Poisonous Snakes. Springfield, Illinois: Charles C. Thomas. 184 pp. LCCCN 73-229. ISBN 0-398-02808-7. ↑ Daboia[dead link] at MSN Encarta[dead link]. Accessed 26 September 2006. Archived 2009-10-31. ↑ Murthy, TSN. 1990. Illustrated guide to the snakes of the Western Ghats, India. Zoological Survey of India, Calcutta. 76 pp. ASIN B0006F2P5C. ↑ Sri Lanka Wildlife Conservation Society – Checklists of the Snakes of Sri Lanka[dead link]. Retrieved 2 August 2007. ↑ Belt P, Warrell DA, Malhotra A, Wüster W, Thorpe RS. 1997. Russell's viper in Indonesia: snakebite and systematics. In R.S. Thorpe, W. Wüster & A. Malhotra (Eds. ), Venomous Snakes: Ecology, Evolution and Snakebite. Clarendon Press, Oxford. Symposia of the Zoological Society of London, No. 70:219–234. ↑ Antiphospholipid Syndrome at SpecialtyLaboratories. Retrieved 27 September 2006. ↑ Checklist of Indian Snakes with English Common Names Snakes-Checklist.pdf[dead link] at University of Texas. Retrieved 22 October 2006. ↑ Daboia russelii siamensis at Munich AntiVenom INdex (MAVIN). Retrieved 23 October 2006. Breidenbach CH (1990). "Thermal cues influence strikes in pitless vipers". Journal of Herpetology. Society for the Study of Reptiles and Amphibians. 24 (4): 448–50. doi:10.2307/1565074. Cox M. 1991. The Snakes of Thailand and Their Husbandry. Krieger Publishing Company, Malabar, Florida. 526 pp. ISBN 0-89464-437-8. Daniels, J.C. Book of Indian Reptiles and Amphibians. (2002). BNHS. Oxford University Press. Mumbai. viii+238pp. Dowling HG (1993). "The name of Russel's viper". Amphibia-Reptilia. 14: 320. doi:10.1163/156853893X00543. Gharpurey K. 1962. Snakes of India and Pakistan. Bombay, India: Popular Prakishan. 79 pp. Groombridge B. 1980. A phyletic analysis of viperine snakes. Ph-D thesis. City of London: Polytechnic College. 250 pp. Groombridge B. 1986. Phyletic relationships among viperine snakes. In: Proceedings of the third European herpetological meeting; 1985 July 5-11; Charles University, Prague. pp 11–17. Jena I, Sarangi A. 1993. Snakes of Medical Importance and Snake-bite Treatment. New Delhi: SB Nangia, Ashish Publishing House. 293 pp. Mahendra BC. 1984. Handbook of the snakes of India, Ceylon, Burma, Bangladesh and Pakistan. Annals of Zoology. Agra, India, 22. Minton SA Jr. 1974. Venom Diseases. CC Thomas Publishing, Springfield, Illinois. 386 pp. Naulleau G, van den Brule B (1980). "Captive reproduction of Vipera russelli". Herpetological Review. Society for the Study of Amphibians and Reptiles. 11: 110–2. Obst F (1983). "Zur Kenntnis der Schlangengattung Vipera". Zoologische Abhandlungen. Staatliches Museums für Tierkunde in Dresden. 38: 229–35. Reid HA. 1968. Symptomatology, pathology, and treatment of land snake bite in India and southeast Asia. In: Bucherl W, Buckley E, Deulofeu V, editors. Venomous Animals and Their Venoms. Vol. 1. New York: Academic Press. pp 611–42. Shaw G, Nodder FP. 1797. The Naturalist's Miscellany. Volume 8. London: Nodder and Co. 65 pp. Shortt (1863). "A short account of the viper Daboia elegans (Vipera Russellii)". Annals and Magazine of Natural History, London. 11 (3): 384–5. de Silva A (1990). Colour Guide to the Snakes of Sri Lanka. Avon (Eng): R & A Books. ISBN 1-872688-00-4. Tweedie MWF. 1983. The Snakes of Malaya. Singapore: Singapore National Printers Ltd., 105 pp. ASIN B0007B41IO. Vit Z (1977). "The Russell's Viper". Prezgl. Zool. 21: 185–8. Wall F (1906). "The breeding of Russell's viper". Journal of the Bombay Natural History Society. 16: 292–312. Whitaker R. 1978. Common Indian Snakes. New Delhi (India): MacMillan. 85 pp. Wüster W (1992). "Cobras and other herps in south-east Asia". British Herpetological Society Bulletin. 39: 19–24. Zhao EM, Adler K. 1993. Herpetology of China. Society for the Study of Amphibians & Reptiles. 522 pp. ISBN 0-916984-28-1. DRVVT test information at Lab Tests Online. Accessed 5 September 2007. Dilute Russell's Viper Venom Time at LabCorp. Accessed 5 September 2007. Russell's viper at Naturemagics. Accessed 5 September 2007. Russell's Viper at Michigan Engineering. Accessed 5 September 2007. Russell's viper at SurvivalIQ. Accessed 5 September 2007. When a cobra strikes: Interview with Romulus Whitaker, dated Sunday, June 13, 2004, at The Hindu. Accessed 5 September 2007. Mark O'Shea in Sri Lanka at Mark O'Shea. Accessed 5 September 2007. Common Poisonous Snakes in Taiwan at Formosan Fat Tire. Accessed 5 September 2007. Vipera russelli at Snakes of Sri Lanks. Accessed 5 September 2007. Video of Daboia russelii లో వీడియో. Accessed 5 September 2007. Video of Daboia russelii feeding లో వీడియో. Accessed 5 September 2007. ఈ పేజీలో చివరి మార్పు 15 జూలై 2018న 13:55కు జరిగింది.